Every person in this world has their own name.Each person is named by family, relatives and friends. But when a person is given some particular responsibilities to work as the head of any particular union or party he/she has a new name and recognition as party head, President etc. I;e He plays crucial role at different stages to get issues related to employers and members resolved.Thus being the head of any union he itself can take and suggest the decisions for the betterment of employees but it is only possible when a head will work on ground zero with true heart not for personal interests to achieve it’s malicious dreams. Recently a top trade unionist of J&K and President Jammu and Kashmir Teachers Forum (JKTF) Abdul Qayoom Wani on submitted volunteer retirement from the government services and resigned from the basic membership of Jammu and Kashmir Teachers Forum (JKTF), Teachers Joint Action Committee (TJAC) and Employees Joint Action Committee (EJAC) to join mainstream politics in J&K,he’s the same person who in year 2016 told people that ” I will never join mainstream politics till the issue of J&K isn’t resolved”.It was deadliest year of recent decade in which more than 10000 persons were arrested,150 were killed and thousands were blinded with pellets. 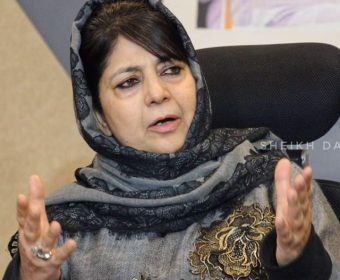 Dramatically Qayoom Wani has now joined the same political party – PDP who was in the government during same year and was ally of BJP in year 2016.Qayoom Wani is believed to contest Lok Sabha elections from North Kashmir – Baramulla District. Satiric period is the sitting MP of Baramulla who began it’s political innings in the name of (Aazadi)- Freedom is telling people that Qayoom Wani will work better than him for the welfare of the people, the said MP is the known power hungry. Qayoom wani is the same person who used to participate in day long protests and hunger strikes, although it seems he was working for its employees but rather he was making ground to enter mainstream politics by playing with emotions of people and using the name of his employees. The same person is telling people now he has joined the mainstream to serve the people but how come is it possible, a person who used to take pay from state as as teacher who didn’t serve it’s students,how can he help the people. The problem is the process continues from last four decades people are using the name of unions, emotions, feelings, killings organizations, agitations etc. to make their entry in mainstream politics and they’re easily paved by existing mainstream political parties, who are known for Uncle-Nephew favors. It ain’t only about this particular person rather their are thousands who are using their name for fame. Somebody is coming up with name any organization to make money and fame, someone is using emotions and feelings of any community, others are using the name of conflict to enter in this filthy environment. Now is the time for introspection. We shouldn’t allow such people to ruin our state, we shouldn’t give them such heights or stages to reach common masses only after that we can save our state from these greedy craps.